Announcement Give your special someone a unique gift this year-one that was handmade with love. Free shipping with orders over $25! Give your special someone a unique gift this year-one that was handmade with love. Free shipping with orders over $25! New! The Staniel Cay Coffee Table Book is available just in time for the Holidays! 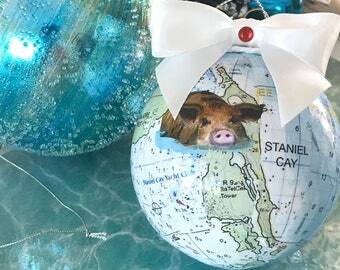 The idea for my ornaments came out of my love for travelling to the Exuma Cays. My husband and I have been visiting the islands since 2000, and have watched the popularity of these islands explode over the last several years. I received my inspiration for my ornaments one year while I was trying to think of how I could decorate my Christmas tree to reflect my love for the Exuma Cays. 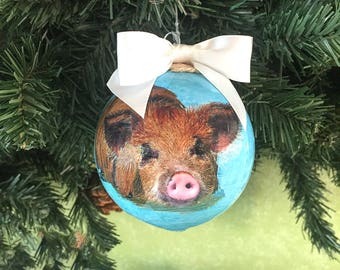 I made my first Swimming Pigs ornament from one of my earlier photographs, and loved the way it made me smile whenever I looked at it. It was unique, and I thought it was such a nice way to remember my trip to see the swimming pigs! I decided to give one as a gift to a friend the following year, and they loved it. I had people asking me if they could buy one, and that year I opened up OceanBlueGifts. I would like to give special thanks to Explorercharts.com. I love having a camera in my hand, and it is very rare that you will see me without one, even if it is with just my Iphone. I love taking photographs that are related to the ocean, whether it is beach photography, nautical prints, coastal scenes, or beautiful sunsets and sunrises. As of recent, I have added Fine Art Prints to my store in hopes that my customers will find a photograph that they can connect with, from perhaps a favorite vacation spot or a scene that brings back a memory. I produce most of my prints on Fine Art Premium Lustre Paper for a professional look, and I have them matted so they are ready for you to bring to a framer, or drop into a standard frame (depending on your size you order). I hope you enjoy browsing through my shop, and if I can answer any questions for you, please let me know! I respond quickly.